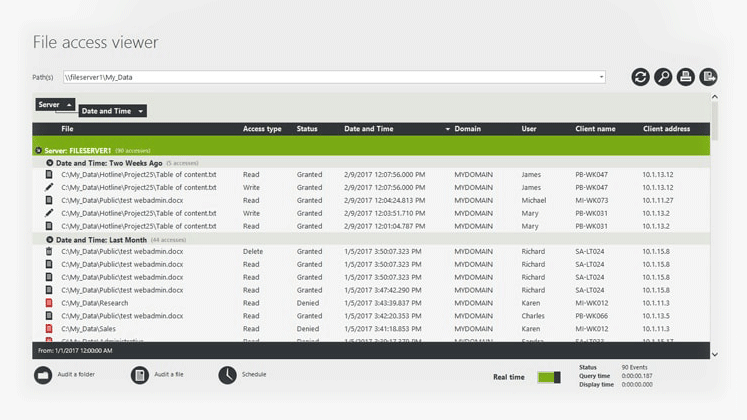 FileAudit constantly examines and records read/write/delete accesses (or access attempts), file ownership changes and permission modifications – in real time - so IT or management can immediately address any inappropriate activity. 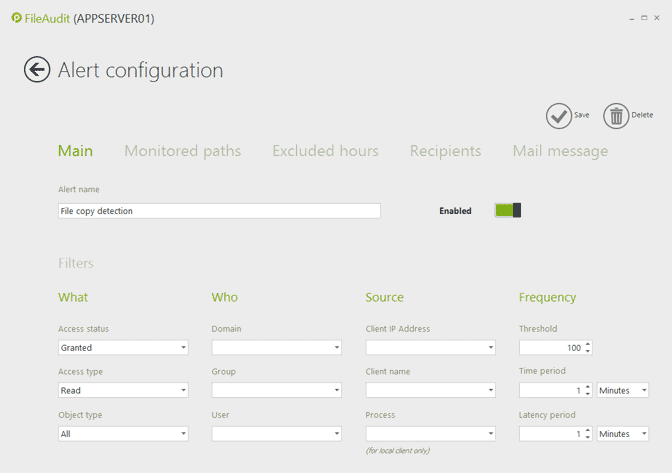 Receive automatic email alerts to predetermined access events (e.g. access denied, file deletion, specific user, IP address or file access, and mass access events such as bulk file copying). Instantaneous notification of a potential security breach that enables an immediate reaction when necessary. FileAudit instantly provides comprehensive and accurate information about access to file and folders across multiple Windows Servers, through its schedulable, automated and multi-criteria reporting. It provides an organization with complete visibility of all activity across a Windows File System. Centralizing and archiving all file access events occurring on one or several Windows systems generates an always available, searchable and secure audit trail. The ability to monitor and audit file activity across the whole organization means precise answers can be given to who did what, when and from where. With powerful filtering capabilities, FileAudit can exclude irrelevant data and focus on only insightful and actionable information. This approach helps you find the answers you need – not just log data - with far less effort. Scan options allows certain access events to be excluded from the audit trail. Configure the auditing to exclude user accounts, application or file types to obtain the pertinent access audit your organization needs. Create specific accounts for people with no administrative rights allowing them to perform audits securely and autonomously. In this way external auditors can use FileAudit without breaching security protocols and monitoring can be delegated to managers who have a better understanding of sensitive files across their business line. If you'd like to have a chat with us about FileAudit, please select this option. If you'd prefer to email or phone us, our details are also here.